50mm Lens @ 22 1/2 feet (State Street, Chicago), 2014. The Facility for Arts Research will host Olivia Valentine as FAR and Away Resident from April 1st through 5th. Olivia is an interdisciplinary visual artist working primarily in textile construction, creating architectural scale textile installations and collaborative projects that span a variety of media and disciplines. She is the recipient of a Fulbright Fellowship for Installation Art in Turkey and the Brandford/Elliott Award for Excellence in Fiber Arts and has exhibited her work internationally. Olivia received her MFA from the School of the Art Institute of Chicago and her BFA from the Rhode Island School of Design. She is currently an Assistant Professor of Art and Visual Culture at Iowa State University. Olivia will present her work in a FAR Research Night at 7Pm Thursday, April 4th that is free and open to the public. Please join us in welcoming Olivia to Tallahassee and learning about her intriguing cross-disciplinary projects. 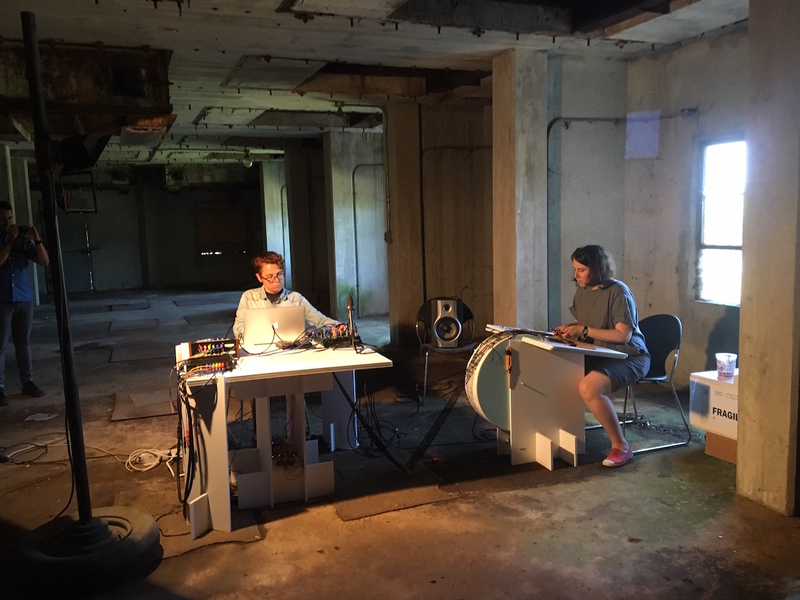 Between Systems and Grounds is an ongoing collaboration between composer Paula Matthusen and visual artist Olivia Valentine, drawing on a mutually developed practice combining textile construction and electronics in real-time. The project grows with each iteration and performance, integrating field recordings, radio signals, feedback, and a system of cues that all contribute to the slowly-growing textile. The textile lives and grows in handmade foamcore furniture, that acts as a work surface, sculpture, and music box that slowly plays back accumulated recordings triggered by the textile. As the project continues, all of the systems will continue to grow and change in response. The FAR and Away Residency is envisioned as a vehicle for supporting a visiting artist’s research by forging connections with faculty from across the university. With the help of the CFA, FAR funds a week-long visit and provides a home base and for the artist. The residency’s focus is idea generation through interactions with FSU artists and scholars with shared research topics. The FAR and Away Resident presents their work publicly in a FAR Research Night where students and attendees have the chance for one-on-one conversations with the artist. During her time in residence at FAR, Olivia is interested in connecting with CFA faculty to explore ideas of printmaking, mechatronic art, electronic music, and dance. She will have the opportunity to visit the Mechatronic Art class co-taught by Rob Duarte and Dr. Jonathan Clark from the FAMU-FSU College of Engineering. As a means of documenting her residency, Kevin Curry will record a podcast interview with Olivia.